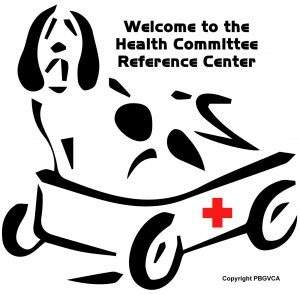 PBGVCA Health Committee Reference Center – Petit Basset Griffon Vendéen Club of America does not provide specific medical advice, but rather provides users with information to help them better understand health and disease. Please consult with a qualified health care professional for answers to medical questions. Petit Basset Griffon Vendéen Club of America does not provide specific medical advice, but rather provides users with information to help them better understand health and disease. Please consult with a qualified health care professional for answers to medical questions. PBGVCA does not provide specific medical advice, but rather provides users with authoritative information to help them better understand health and disease. Please consult with a qualified health care professional for answers to medical questions. Welcome to PBGVCA Health Committee Reference Center. To have the most current information readily available for providing optimal health care and for making wise choices in managing breed-specific health care issues. To develop and maintain educational information targeted to general health care of the PBGV. To develop and maintain a knowledge base of medical problems specific to the PBGV including clinical resources to assist with diagnoses, treatment and management of breed specific health issues. To have the resources available to assist PBGV breeders and owners in making decisions for the health and welfare of the breed. Using computer, see category listings in left-hand column . Viewing on phone, select Menu icon to see category listings.